Getting started with a video security surveillance system has never been so convenient. Owing to the introduction of several user-friendly features, not much technical expertise is needed to set up a video security system. Many homeowners install these systems on their own for protecting their premises from intruders and burglars. The EZVIZ 4-Channel 1080p Analog HD System with 1TB Hard Drive and 4 Weatherproof Bullet Cameras is a robust and affordable system for protecting your space. The surveillance kit views and records video from 4 points in your home or office, on a 1TB hard drive. 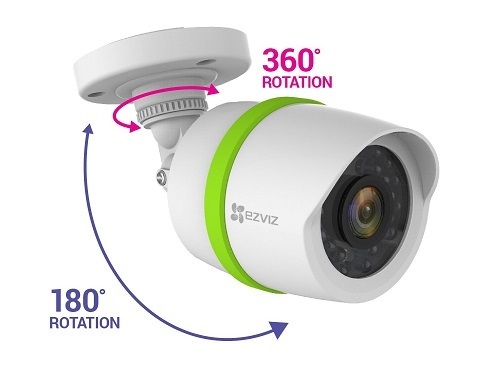 With the help of the EZVIZ app, you can view all EZVIZ cameras even when you are traveling or away from home. With the security system, you can check in on your home wherever you have an internet connection for being alerted on your mobile device if the cameras have sensed any movement. All data is protected with triple-layer security as well as bank-level encryption to protect all the moments you capture. When using this product here are some requirements that are going to be needed. The cameras are IP66-certified and are capable of operating in extreme weather conditions, be it sunshine or rain. You can also take help from technology experts via for chat when any system upgrades are released. Any movement detected is recorded and a notification is sent immediately to the user’s smartphone. Users can customize the detection areas for taking care of false alarms. The EZVIZ Security Camera System has gathered positive reviews from almost all buyers. Users have found it convenient to set up by simply plugging cameras and connecting them to the internet. All buyers are happy with the highly intuitive app although a few of them complain that the video can sometimes take longer to load. Almost all testimonials on Amazon indicate that it’s a good product for its value. Although some users found it difficult to set up, nonetheless, they were happy with the results they got from the security system. The EZVIZ Security Camera System holds a decent rating. You can busy this affordable surveillance equipment for less than $200 with free shipping from Amazon. All EZVIZ products are available with a 1-year limited warranty in North America and lifetime technical support. Keeping the system updated is easy with one-click firmware updates, and in the installation is convenient. The weatherproof EZVIZ Outdoor 1080p Video Security Surveillance System efficiently protects the indoor and outdoor areas of your home 24/7, in all seasons. All these features make this product a valuable purchase worth every penny.